Thailand’s trade balance swung to a larger-than-expected deficit of US$4.032bn in January from a US$1.065bn surplus in December on surprisingly strong imports and weak exports. This is the worst trade gap since April 2013 coming amid the ongoing THB appreciation to the highest level since October 2013. Exports contracted by 5.7% year-on-year, the worst reading in two-and-a-half years, while imports bounced by 14%. This compares to consensus estimates of -2.1% and -1.0% respectively for exports and import growth. The details trade breakdown wasn’t available at the time of this writing but we suspect electronics and automobiles remained the weak spots in exports, while the trade war manifests into weakness in shipments of products to China and Europe. Fuel has been a source of import strength lately and likely gained further momentum with firmer global oil prices coming into 2019. Also released alongside trade data, tourist arrivals slowed to 4.9% YoY in January from 7.7% previously. 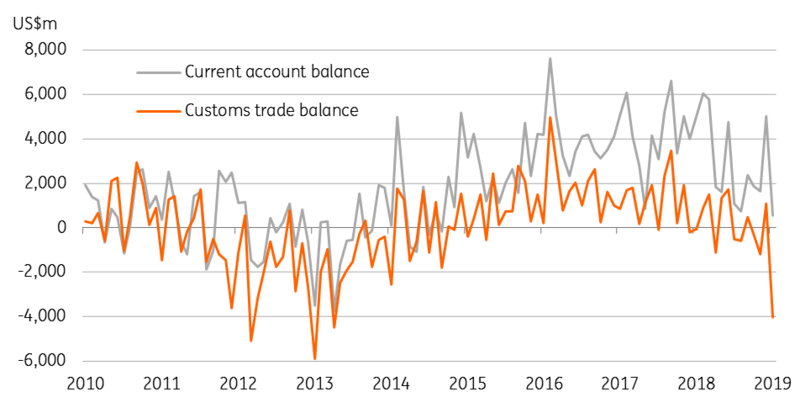 The double-whammy from a weak trade account and slower services inflows from tourism likely have dented the current account balance in the last month. This prompts us to downgrade our current account surplus forecast for January from US$3.7bn to US$0.5bn. Despite the negative swing in the current account the overall balance of payments (BoP) continued to be strong judging from steadily rising foreign exchange reserves and appreciating currency. The January BoP data is due next week (28 February). The weak start to the year is consistent with the view of a continued narrowing of the current surplus in 2019. At 7.5% of GDP in 2019, the surplus was down from 11% in the previous two years. 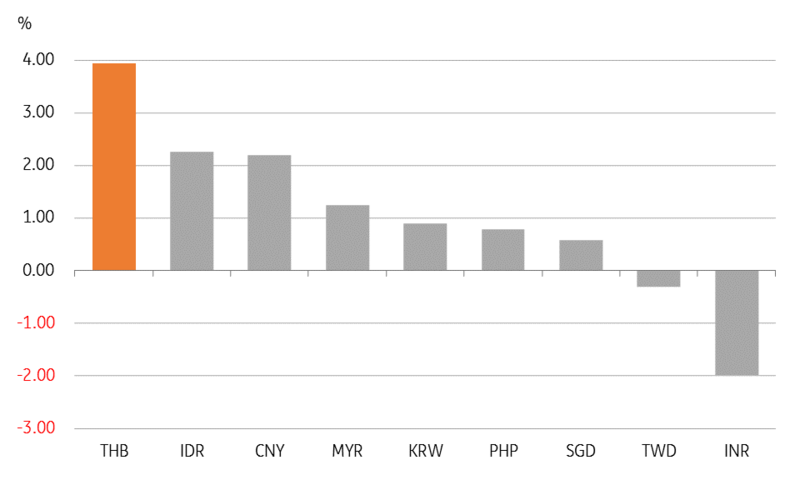 We forecast 4.5% this year, though this is still strong among Asian countries to serve as a source of continued currency outperformance. But for now, today’s data could hinder the ongoing THB strength, while rising political uncertainty ahead of elections in March weighs on the currency performance. The USD/THB rose 0.2% in a knee-jerk reaction to trade data to 31.34. We maintain our view of the pair rising to 32 in the near-term.